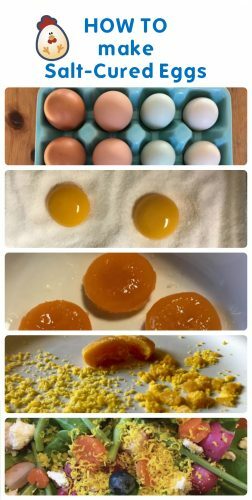 I am always excited to try a new egg recipe, and I thought I’d share this easy recipe for salt-cured eggs with you, too. Salt-cured egg yolks are solid, dry cured discs that can be used grated, sliced, or crumbled, almost like a cheese. They add a salted creamy flavor to any dish. It’s simple to do and will make any dish seem gourmet! So don’t let those egg yolks go to waste. Salt-cured eggs are easy and delicious! Step 1: Select the eggs you’ll use. You may choose any size chicken eggs. For this recipe, I used eggs from my Svart Hona, Pippi, which tend to be on the smaller side. It’s important to remember that the larger the yolk you use, the longer it will take to cure. 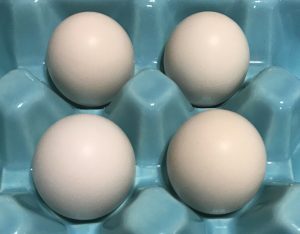 You can see on our website how to cook with different-sized eggs such as you might get from your backyard flock. Combine equal parts salt and sugar. I use 1 cup of salt and 1 cup of sugar to cure four eggs in an 8×8 inch glass baking dish. You may also add different dried herbs such as basil, rosemary, or thyme for an additional flavor. Egg yolks placed in the salt-sugar mixture. Spread mixture evenly in the dish and make small indents for the egg yolks to rest in. Separate the egg yolks from the whites, being careful not to break them and place one yolk in each indent. Cover yolks completely with salt/sugar mixture. Then, cover tightly with plastic wrap, refrigerate for 4-7 days. During the next 4 to 7 days the salt helps dry out the yolks, and will also kill the bacteria that makes food spoil, while the sugar will feed lactobacillus (a good bacteria you might find in yogurt or kimchi). Step 3: Rinse the salt-cured eggs. After the 7th day, you are now ready to remove the yolks from their salt-sugar mixture. Brush remaining salt-sugar mixture off yolks and gently run under cold water until all of the salt-sugar mixture is removed. 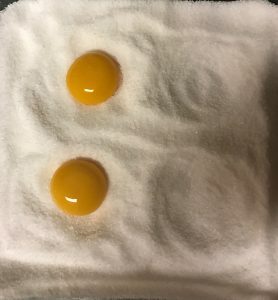 The yolks should look similar to this once rinsed off carefully. Step 4: Complete the final drying of the salt cured eggs. You will now need to pat off any excess moisture with a paper towel. Then place on a baking sheet lined with parchment paper and bake at 150 degrees for 2 hours. You may also place in a dehydrator for a couple hours. Once done, the salt cured egg yolks are a perfect consistency for grating and crumbling! 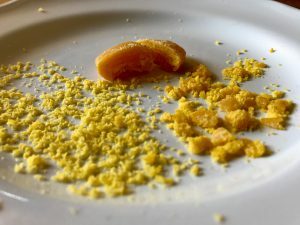 Grated and crumbled salt cured egg yolks. The possibilities of this garnish are endless! The yolks will taste great crumbled, grated or sliced over many dishes. The yolks will stay fresh in a sealed container for up to three months. One of the many reasons salt cured eggs appealed to me is that you can use them on so many different dishes. So far I have enjoyed it on salads, pasta, crumbled on roasted vegetables, and soups. 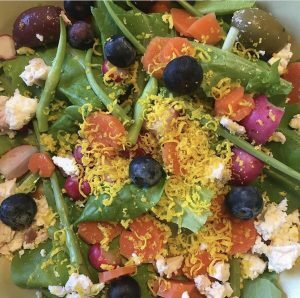 A fresh salad with grated salt cured egg yolk on top. 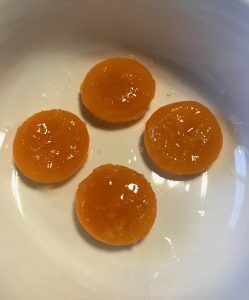 Have you made salt cured egg yolks before? What is your favorite dish to use them on? Tell us in the comments below. How do store those, if you do many? Can you put in a jar? Hi Donna, Great question! You can store these in any air tight container. A sealed jar would work great. I hope you enjoy these! What would the shelf life of these eggs be? They usually store well for up to three months. Hope you enjoy!